This book is dedicated to the creators of music. In an industry that is changing faster than anyone could imagine, both big and small players in the business are faced with challenges they could not have dreamed of five years ago. But change provides opportunities equally as unimaginable. This book guides composers, lyricists, and musicians through the changes in the music industry and explains how a performer or group not only can succeed in this new music business but can also use the changes to reach goals that could not have been conceived in the 20th century. 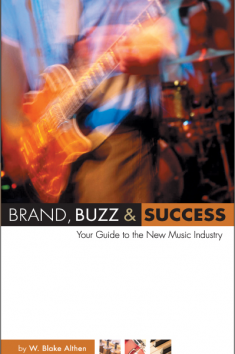 This book teaches musical artists how to become their own name brand – a brand to which industries and individuals will return again and again for their music. It provides a roadmap for success from the first step of establishing goals to marketing music over the Internet. –Every artist from new and emerging performers to industry veterans will benefit from this readable, comprehensive guide. “I thought Blake Althen had done it all in the music biz. Then he wrote a book.